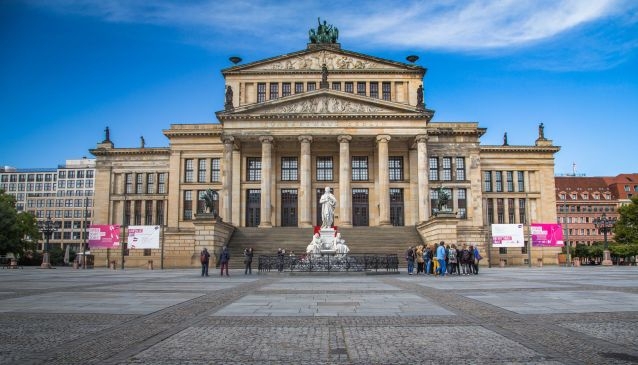 The Gendarmenmarkt is without question one of the most beautiful squares in Berlin and is best known for the trio of buildings comprising the Deutscher Dom(German Cathedral), the Französischer Dom(French Cathedral) and the Konzerthaus (Concert Hall). Rounding out the trio is a statue of one of Germany's most well known and best-loved poets, Friedrich Schiller. The square was established in the late 17th Century in what was to be known as Friedrichstadt, King Friedrich I's new section of Berlin, built to accommodate around 20,000 French Protestants known as Huguenots who had been expelled from France. The square receives its name from the Huguenot regiment of men-at-arms that was deployed there until 1773. During the month of December the Gendarmenmarkt hosts one of Berlin's most picturesque Christmas Markets.